Check out the NEWLY REDESIGNED Micro-Start XP-1 PPS (Personal Power Supply). 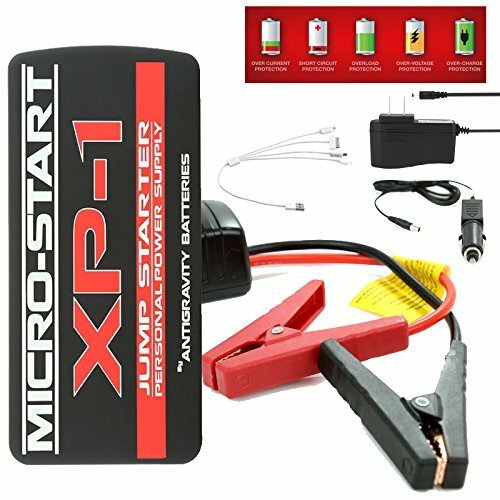 Winner of the SEMA New Products Award in 2013, it was the first & ORIGINAL mini jump-starter and is considered the industry standard in its class. Now the XP1 has been fully redesigned to offer more features, more power, more functionality and as always we are producing the safest unit of its kind with the latest protections built into the unit and its clamps. The XP-1 is so small it fits in your Pocket, Purse or Backpack, yet so powerful it can start Motorcycles, Powersports Vehicles, even V8 Trucks up to 30X in a row! JUMP-START vehicles with gas engine sizes up to 6L V8. Amazingly the XP-1 can also POWER & CHARGE your Devices: Cell Phones, Cameras, Tablets and much more. It has FOUR on-board power ports: a 19V for Laptops, a 12V standard output for all 12V Accessories, and TWO USB outputs for powering 5V USB-charged devices. The XP-1 is extremely lightweight and compact (only 15.25 oz, 6.75 x 3.25 x 1 inches). It's small enough to easily take with you anywhere! Whether you are riding, driving, camping, boating or traveling, remain confident that you will be able to start your vehicle, make that important call, or get that last bit of work done. The Micro-Start PPS even has a 3-mode high-power 110-Lumen LED Flashlight built-in, with 2 flash patterns including a S.O.S. flashing beacon. Vehicles with Gas Engine up to 6 Liter V8: Cars, Trucks, Motorcycles, ATVs, UTVs, Snowmobiles, other Powersports Vehicles, Boats, other Watercraft. 200 Amps starting current - 400A Peak! The XP-1 comes in a convenient Carry Case with EVERYTHING you need to Jump-Start your Vehicles and Charge your Electronics no matter where you are. The XP-1 can be recharged up to 1000 times for a long service life! REDESIGNED WITH MORE POWER - Will start a V8 with EASE - The difference between the XP-3 and XP-1 is more capacity, a port to use the Tire Inflator and a port to charge your laptop. Charges a smart phone in 30-60 minutes several times. NOW WITH TWO USB PORTS 4 Power Ports: 19v for laptops.12v standard output for all 12v accessories. (2) USB 5v for charging or powering ANY 5v USB device. Comes in a convenient carrying case with all of the required adapters. Built-in High Powered LED light with pre set flash patterns including "S.O.S." Built in over-charge and over-discharge protection to avoid harming your battery. THE ANTIGRAVITY ADVANTAGE: 1 YEAR MANUFACTURER WARRANTY OFFERS USERS PEACE OF MIND KNOWING THEIR UNIT IS BACKED BY THE ANTIGRAVITY. HIGH PERFORMANCE, QUALITY CRAFTSMANSHIP AND A BRAND YOU CAN TRUST. If you have any questions about this product by Antigravity Batteries, contact us by completing and submitting the form below. If you are looking for a specif part number, please include it with your message.